NSX Archives - Clouds, etc. Over the past few weeks, Wissam Mahmassani, Abhinav Mishra, and I have created a few walkthrough videos on setting up Cross-VDC networking inside of vCloud Director 9.5. The intent of these videos is to discuss setting up Cross-VDC networking in vCloud Director but also have a live chat on items we’ve learned along the way with working with it. Quite frankly, it was an open discussion between the team on the inner workings on vCD/NSX and what our development team has done in the backend. In the first video, we discuss the pre-requisites before we can start configuring vCloud Director for Cross-VDC networking. In essence, the assumption is cross-vCenter NSX has already been established and we have the primary and secondary NSX managers registered. Next, we review the concept of creating a Datacenter group and what are the different egress options. This is very important as it explicitly controls how traffic exits the overlay environment. Here, we discuss how BGP weights control our active/passive egress points and what vCD automates in the backend. The key is this is all done without provider/tenant configuration – vCD automates this process. As a final wrap-up of the BGP weights, we review creation of the stretched networks inside of vCloud Director along with operational management inside of the vCD H5 UI. Last of all, we demonstrate testing of Cross-VDC and failover of my “Daniel-App” between the two sites. What’s interesting is the ability to migrate egress points without any loss of connectivity. Unintended failover is managed by BGP weights, which the default timer is 60 seconds and could be revised if required. As stated before, this shows the requirement of having a mirror Edge configuration, especially for NAT configuration and failover testing between sites. This was a fun experience with the team while reviewing and having open discussions on Cross-VDC networking. We are hoping these are valuable for those of you that are interested in bringing this as a new service inside of vCloud Director. NSX-SP Base – this is is your fundamental level of NSX. It does include your normal Edge services, Edge Firewall, NAT, Load Balancing, Dynamic/Static Routing, IPSEC/SSL VPN+, and Distributed Routing and Switching. This is typically referred to as “vCNS” mode (callout to the vCD old days) but does use NSX. NSX-SP Advanced – this includes Base, plus ECMP and Distributed Firewall functionality. Service Insertion, AD Integrated Firewall, etc. are all functions that the Provider can consume from the backend management. 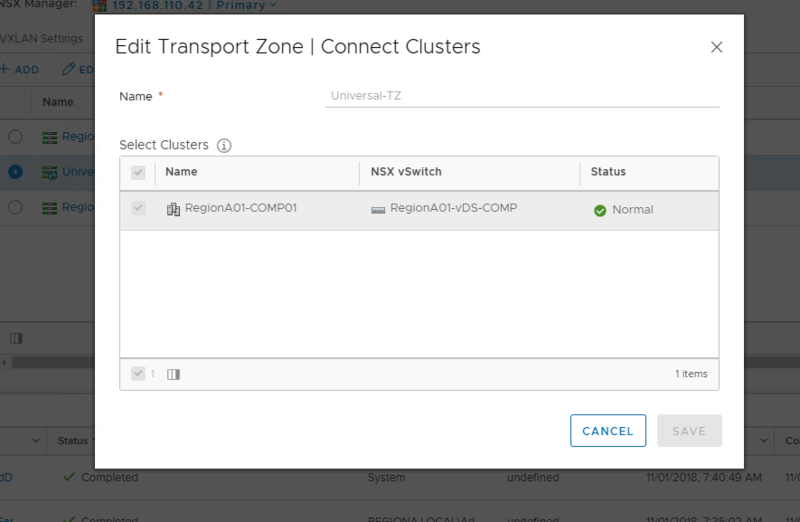 NSX-SP Enterprise – this includes Advanced along with HW VTEP integration, cross-vCenter NSX functionality, along with the L2VPN (Remote Gateway) solution. The new addition here is vCD 9.5 Multi-Site and Cross-VDC capability. To state the obvious – vCloud Usage Meter will take care of automatic metering based off of what NSX functionality is used, this has been available since version 3.6. Check out this post that discusses how Usage Meter detects NSX (and vROPs) usage. Last of all, the “Convert to Advanced Gateway” inside of vCloud Director for organization Edges DOES NOT mean you will be using NSX Advanced right away! This is just a change in how vCD presents the Edge UI (with Advanced, it’ll show the H5) along with the API rights available. I demonstrate this in the above post too. So what does one gain when using these rights? Well, they are now aligned to the VCPP NSX bundles and can be utilized as a starting to monetize NSX inside of a vCD environment. Now, in my experience, these specific vCD permissions will apply to the VCPP NSX levels as stated above. The big thing I found in my testing is ECMP can be toggled with Static Routing, so I set this as “View Only” for any routing capability for SP-Base. If you are using vCD 9.5, one could also create a rights bundle that is published to an organization along with utilizing Global Roles to make this *much* easier. Alright, here are the three exports for these rights required. This is not comprehensive for all vCloud permissions required, but gives you an idea of what to append to your existing role (which could be easily done via REST API). Note that the exports below show my vCD instance (vcd-01a.corp.local) along with the org UUID, so replace this if you are doing a POST. I hope this helps others on aligning to the VCPP NSX levels and how to establish NSX capabilities inside of a vCD environment. In this post, I will be reviewing the necessary steps to support Cross-VDC Networking inside of VMware vCloud Director 9.5. These are fairly straightforward since it aligns to the standard requirements set forth from Cross-vCenter NSX. Multi-Site management must be configured between the vCloud Director instances. I will try to add a post on establishing this at a later time. Ensure you have a unique vCloud Director installation ID. If you have duplicate IDs, this can lead to MAC address conflicts. Fojta did a blog post on updating your ID – please accomplish this before continuing. vCD 9.5 does require a standard Cross-vCenter NSX configuration implemented between the resource/payload vCenters before we can do any configuration at the vCloud Director level. Now I’m ready to connect it to my respective clusters on Site-A and Site-B. Keep in mind I need to hit the drop down for the NSX Manager and attach the respective cluster at your secondary (or additional) location. Control VM Resource Pool vCenter Path – this can be either the MOref object id OR the ‘Cluster/RP’ path – I chose the former. Network Provider Scope – now this is where we establish a fault domain. This Network Provider Scope could cover one or many vCenters in a single vCloud Instance. However, when we establish the vdc-Group, we must have a minimum of two different/unique fault domains (or network provider scope) inside of the created vdc-Group. Click on the Network Pool and Services sub-tab and you’ll see a new box below the Network Pool that states ‘Enable Cross VDC Networking (Using Network Pool “<Universal-TZ-Pool>”‘ Check this box. This still allows for local oVDC network creation using the traditional network pool as stated in the screenshot above – this is not a complete conversion to the Universal Transport Zone. More to come here on the Cross-VDC networking capabilities within vCD 9.5 from myself, Wissam Mahmassani, and Abhinav Mishra. Thanks!